Yesterday I was listening to a talk by Matthieu Ricard. Matthieu is the French Translator for the Dalai Lama, author of bestselling books on happiness and altruism, and regarded by the media as one of the happiest people alive, due to the result of scanning his brain. Matthieu was talking about the difference between empathy and compassion. Empathy is tuning in and feeling what another person is feeling. If you’re feeling sad, and I have empathy, I feel sad too. Empathy is of course valuable, but has its problems too. Excessive empathy can lead to burnout, especially in the care-giving professions, as you’re constantly feeling what others are feeling. Compassion is feeling what others feel, but also with a desire to alleviate that suffering. According to research by Dr. Tania Singer, it’s empathy that can lead to burnout, and not compassion. Compassion develops deep levels of wellbeing and high levels of resilience to stress. For Matthieu, one of the best ways to cultivate compassion is through the loving kindness meditation (called Metta Meditation too). I don’t practice loving kindness meditations everyday - just from time to time. But having attending a conference all about the value of care with power, I am motivated to practice it more regularly! Get nice and comfortable, and relax as best you can. Take several deep breaths and enjoy as far as possible. Be mindful of your body, and re-adjust your posture as necessary so you’re extra comfortable and at ease. Bring to mind a close friend, spiritual person or some other person, alive or dead, for whom you have unconditional love... it could even be an animal like a puppy, kitten or even a flower. Imagine looking at this being... hugging them... looking in their eyes. Wish them well. Wish them happiness. Wish that they are free of suffering as far as possible. Then, continue to expand to your close community, then to a city, nation, continent and eventually the whole planet. Keep wishing each one happiness and peace. Take your time on each stage. Visualise as much as you’re able to, and feel the feelings that arise. Wish all living beings happiness and peace and love. Imagine a golden light enveloping the earth, if you find that a helpful image. Then, last but not least, bring yourself into the picture. Sending yourself just as much love and compassion as you’ve been wishing everyone else. Try placing your hand on your heart if that’s helpful, too. Enjoy any feelings of warm-heartedness that you may have. And if you didn’t have a positive experience, don’t worry. That’s not unusual - this isn’t easy at first. It takes time and practice. You can learn more from this 10 minute Talk on Compassion by Matthieu Ricard. For a guided Metta Meditation in the above approach by Ajahn Brahm, try this video. For a more traditional guided loving kindness meditation, try this site. For a detailed description of how and why practice compassion, check out the Greater Good site here. If you’d like to discover more about compassion, check out our upcoming conference here. 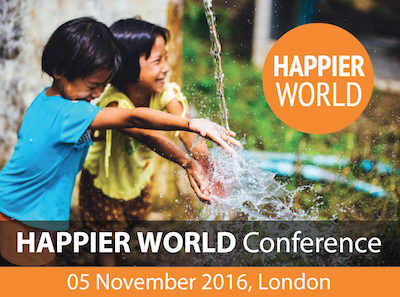 A unique opportunity to explore how to create a Happier World on 5th November 2016 in London.